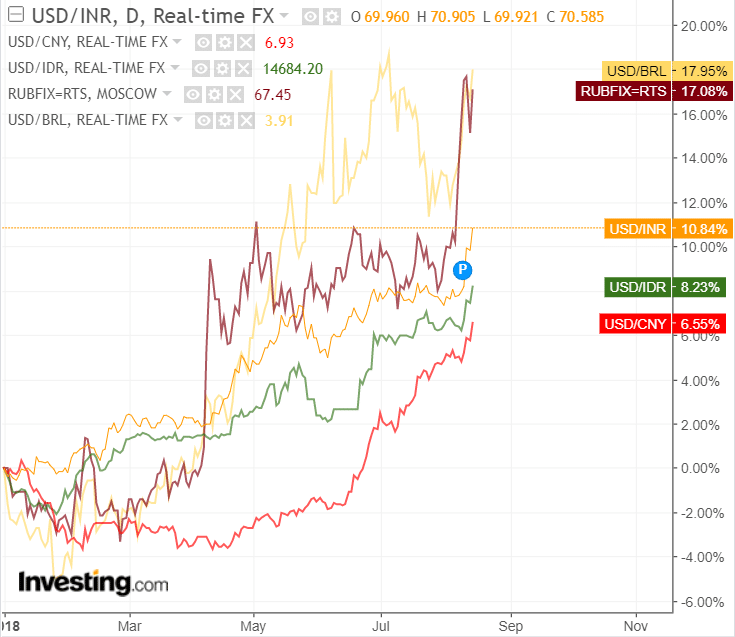 Is there a big problem if the USD has appreciated so that it’s Rs. 70 to a dollar? There are some implications, but it’s somehow not that dramatic as its made out to be. 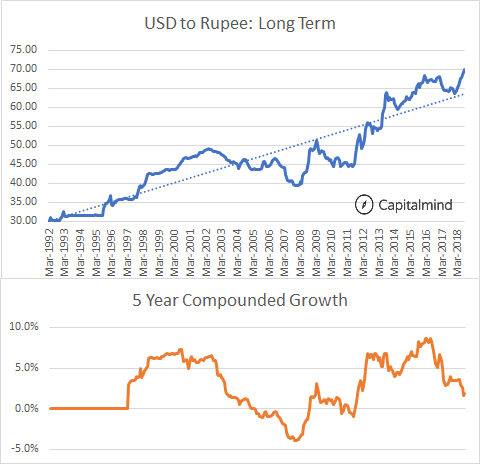 We wrote about a few myths about the falling rupee when it did a dive last time in 2013 (Read post: Six myths about a falling rupee). It’s time to look at the rupee in context again. Why should the rupee depreciate? Or stay strong? The argument is actually quite simple. Consider you have a world with only two countries: India and China. Let’s say China has Indian rupees in its forex kitty. Now they can use those rupees to buy Indian items – let’s say they buy masala dosas if Rs 100 each, worth 100 cr. rupees and import them into China, and sell it at, say, 10 cr. Yuan Renminbi (let’s just call it CNY). The exchange rate is 1 CNY = 10 Rupees. Effectively, the Chinese have bought 1 cr. masala dosas from India at 1 CNY = Rs. 10 and sold it locally at CNY 10 per dosa. Let’s say Indian inflation is 10% but Chinese inflation is 5%. Next year: now Masala Dosa in India costs Rs. 110 after a year. If the Chinese buy 1 cr. masala dosas they have to pay Rs. 110 cr. = CNY 11 cr. But they can sell 1 cr. dosas only for CNY 10.5 cr. (since inflation is only 5% in China) This is a problem because the trader will lose CNY 0.5 cr. The exchange rate for the Rupee moved up from Rs. 10 to Rs. 10.48. Why did it happen? Because of relative inflation differences. If you got here, that ends the theory part. Typically the difference in inflation should be reflected in prices of relative currencies. If one country has 3% inflation and another has 7% inflation, then the second country’s currency should depreciate by about 4% a year. However, this is theory, and in practice, people do strange things like trade currencies, set up forward contracts, use hedges etc. And it’s no longer just trade – people invest in other countries, take loans from abroad, send money to their home countries etc. Even central banks play a role, buying other currencies to keep the exchange rate at certain levels. So the demand for a currency is no longer just the demand for goods and services. So currencies don’t depreciate every day according to the inflation formula – there are ups and downs for long periods of time. But over the long term, the inflation differential will stick and cause damage. After many years of wondering what happened to the British Empire, the British suddenly decided they wanted to be part of some other empire somehow. In 1990 they decided to join the European Exchange Rate Mechanism (ERM) which basically limited how much the UK Pound – German Deutchemark could be exchanged at – to a lower level of 2.78 marks to the pound. If it went below that, it would require the Bank of England to buy pounds until the level was maintained. However British inflation was 7% but German inflation was 3%. Interest rates were kept high in the UK because otherwise the currency would devalue. And because of that, in 1992, there was a recession in England, and unemployment rates crept up to 10%. The UK pound was overvalued – the years of keeping it in the ERM had meant that they were uncompetitive from exports and interest rates couldn’t be lowered to stimulate local demand, because it would mean a drop in the currency and a break in the ERM rate. There’s this guy called George Soros. He saw this coming. And bet a big ton of money against the pound by shorting it. Eventually, on a “Black Wednesday” the pound went into freefall, and the BoE tried to increase rates from 10% to as much as 15% on the same day. And even when that didn’t work, Britain left the ERM. The Pound depreciated 15% against the mark. And then, found some stability in both rates and inflation since. But the point is: The fundamentals of relative inflation and flows were more important to the exchange rate even though the Bank of England tried its level best to maintain the currency at a certain level. India also is prey to the same fundamentals. Is the Indian Rupee fall to 70 a very large one? 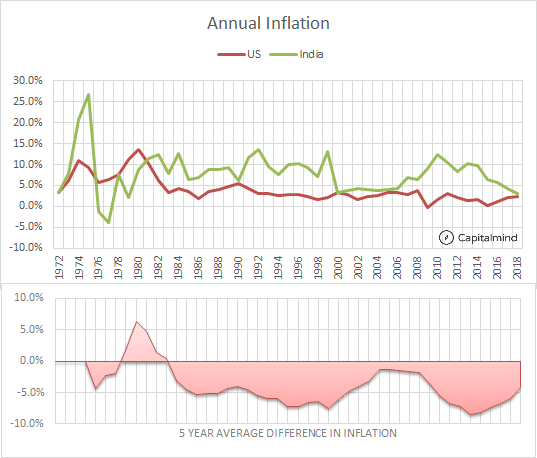 In effect, while the average inflation difference in the last few years has been north of 4% a year between India and the US, the average currency change per year is just 2%. This is obviously a deviation from fundamentals, and therefore we are likely to see a correction. Corrections don’t happen slowly. In India there will be a five year lull and suddenly one big change. That change is likely to be occurring now. It’s not just India, all other emerging markets are seeing major layers of depreciation, and we’ll come to that. Are things getting really bad? It’s nowhere as convoluted as 2008 or 2013, or indeed even 2011-12. 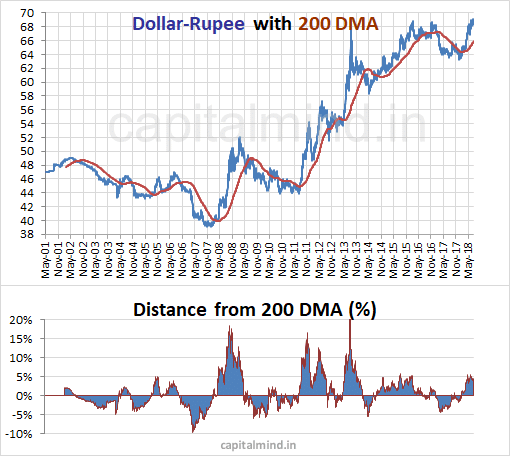 We may have a problem with 70 from a numeric angle, but the natural trend of the rupee seems to take it in that direction, and we’re not actually too far away from the average. Yes, we’ve seen a major damage in Turkey last week and it’s down some 40%+ in the year. But even other emerging currencies are in trouble. Why should other currencies impact us? That means Indian exporters face competition of lower prices from Brazilian exporters. And Indian domestic manufacturers have to face lower prices from Brazilian imports. If the rupee does not depreciate, we will therefore import more and export less. When you import more and export less your trade deficit goes up. India does have a trade deficit (160 billion dollars last year) but that was balanced by a few other things. We had $78 billion of service exports (IT), about $62 billion of NRI remittances, and had to pay dividends and interest of around $28 billion. Net of all this we had a deficit of $48 billion. This was financed by inflows from the other big thing : financial inflows. With FDI ($30 bn), Portfolio investments ($22 bn) NRI Inflows ($10 bn), Loans ($23 bn) and a bit here and there, we actually got $100 billion last year from financial inflows! The RBI has probably spent around 20 to 30 billion dollars protecting the rupee from falling this year. Still less than it added last year. Now if the rupee were to depreciate less than other currencies our trade deficit will WIDEN. And combine that with falling Portfolio investments, and this will result in a depreciation. Again, this is not a major problem. Because the current account deficit is ALWAYS financed. If you don’t finance it through inflows, you will finance it through currency depreciation. The last time, in 2013, we started to see serious depreciation and then the RBI did the big NRI deposit FCNR scheme which brought in $30 billion or so and that meant the rupee didn’t have to fall more. They could do that again, or they could let the currency fall. One thing India does need is a way to make our brands more competitive locally and internationally so we don’t need to import so much. India doesn’t make toys anymore, and much of that is because imported toys are much much cheaper. But there’s a pretty good need for localization – our multiple states and cultures have local needs for toys that are based on folklore or local fads. Even Chota Bheem hasn’t been able to pull it off, or the awesome characters in Tinkle or Amar Chitra Katha. (Why don’t we have a toy set of Mahabharata with a build-it-yourself model? With things like little motors that move a character across a battleground etc? ) But getting toymakers to start in India isn’t only about a weaker currency. The idea should be to massively reform labour laws and make manufacturing easier in India, for India. As in, we should create special economic zones with lower labour laws that aren’t forced to export – but to serve India better. That will reduce imports by just substituting for our imports, which is actually better than pushing exports. We should love our industries – we currently despise them because we believe all the private players are frauds, and we will get told that any labour reform is just going to benefit an Ambani and Adani, while it actually will benefit all Indian manufacturers a lot more. My view on the Rupee fall is: It’s okay if it happens, and 70 or 75 is not a big number. We should learn to adapt to what is likely to happen anyhow. This could spike up interest rates in the short term, or have inflation. But in the long term, our consequent reforms – from labour to FEMA repeal to manufacturing or service growth – will create structures that require less depreciation in the future. Our control of inflation too has been impressive enough to reduce the relative difference with other countries. That’s me off the soap box. I know this will get political, but I don’t care about the politics. The rupee fall, in context, is not a big deal, and we should expect more.